A very witty design that captivated my attention, the "H en voyage" depicts two stacks of suitcases linked between by other and forming the very distinguished "H". What I particularly love about this design is the depth of the picture - the impression of perspective - rendered by the lines that converge in the middle (the design features the square tile motif, also known as the "checkerboard floor" - one of the oldest and favourite methods of depicting and illustrating the vanishing point - which turn into little "H's" as they get farther away; by the same token, these lines reminisce of train tracks, a fitting allusion given the suitcases). The other interesting aspect, not immediately apparent in this particular colour combination, is that the outer border is not the same hue of mustard yellow - instead, two sides are lighter while the other two are darker. 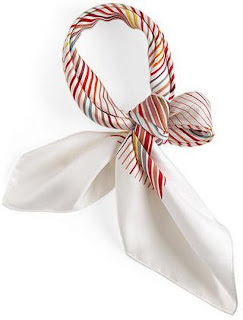 This difference in colours complements well the design when the scarf is knotted, balancing the otherwise potentially monotonous pattern of parallel lines. This design was issued as "vintage-style" scarf (70cm x 70cm). 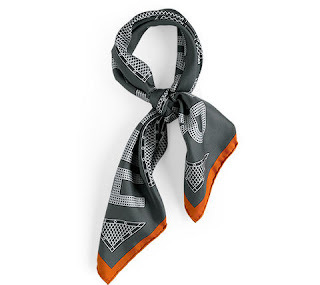 Befitting the "vintage" label, the design is deemed solar - from a focal point in the very centre of the scarf, the images reach out towards the edges, like solar rays. 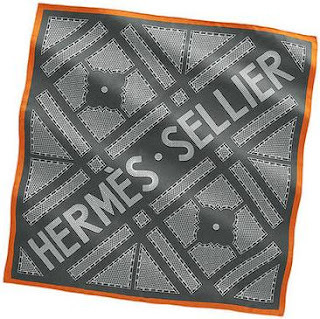 This design technique was very common since the beginning of Hermes' venture into scarves, and had been followed until 1960s, when new design techniques had been explored and adopted. I'm not very fond of the grid-like background, which renders the pattern of the knotted scarf too geometric, but it's a very interesting and refreshing design, which I admire very fondly each time I look at it. Continuing the review of this season's collection is an interesting depiction of a turtle in its gracious "flight" underneath the ocean waves, in a sub-aquatic world that's deceptively peaceful. 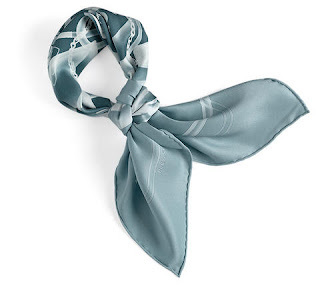 This scarf not only encompasses the exotic destinations of far-away lands, but also beautifully reminds us of the cycle of nature and the many sacrifices mothers make to give birth and care for their young. "De Madras à Zakynthos" ("from Madras to Zakynthos") retraces the unbelievable journey that the nearly extinct Caretta Caretta sea turtles undertake from the Maldives islands, where they live, to their native lands, in the Greek islands, to lay their eggs. 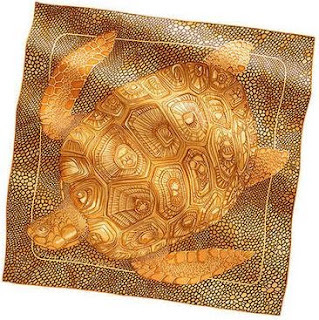 Simple in its composition, the design illustrates a single turtle, in an apparent swimming state, "crossing" the scarf from one corner to the opposing one. I find this design very busy and I would recommend it only to those of us who can sport animal prints - such as leopard - symbolic of their courageous and untamed spirit. A very intriguing pattern is this "Faubourg Express", a deceptively simple scarf that features tastefully bright colours and emphasizes the beauty of pure, white silk. 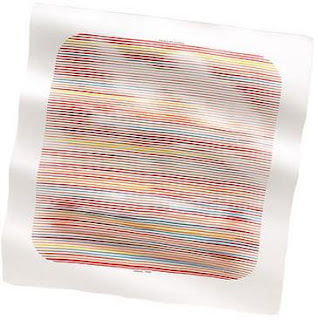 Depicted is a series of thin lines of various colours, drawn parallel to each other, and suggesting the sequence of images as perceived from within a train in motion. This picture does not reflect the shapes of things, yet when the scarf is perfectly flat, the images become apparent. In addition, I consider this knot very elegant and refined, for those adept of making an impactful statement with discrete elements. The artist is Dimitri Rybaltchenko, a very talented designer whose works of art are expressions of supreme artistic creativity. This is a lovely scarf of the 70-vintage collection ("70" refers to the width of the carre, in cm) that appealed to me instantly. I thought of it because a close friend, whom I've known since my years in university, was en route to New York City from Paris today (December 26th) via Toronto when, thanks to the incident onboard a Northwest plane, Air Canada canceled the majority of its flighs bound for the US and so he found himself stranded in Toronto for what would amount to two days. While the prolonged stop-over was unplanned, we made the most out of it, visiting both Toronto and Niagara Falls, and offering him a truly unforgettable experience (the "bonus" of his voyage). 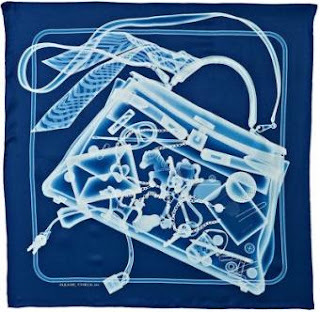 This scarf design, alluding to the an x-ray image scan of a suitcase when inspected by the airport security, illustrates the emblematic objects that Hermes has created over time, such as a Kelly bag (named after Grace Kelly, who used one such back to cover her pregnancy from paparazzi, lending the bag more than just a few extra flash shots; the bag became iconic for Hermes, as did its famous name-sake), a twilly (the elongated silk scarf wrapped, in this image, around the bag handle), the anchor chain scarf ring and the horse-shaped lock, so popular with Hermes aficionados, to name just a few. I find the rendition of such impression, based on the use of colour alone, quite fascinating, for which reason I really really like this scarf. 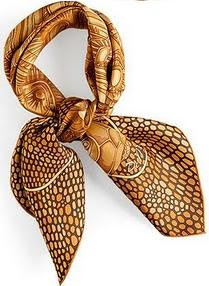 Knotted, it looks equally interesting, lending a very impactful appearance to the wearer. The one aspect that I found disappointing was the limited colour variations of this design. 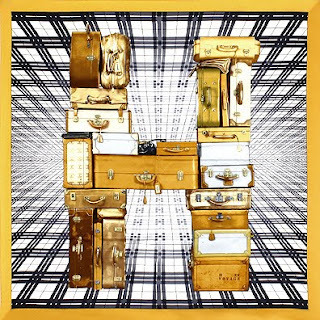 Perhaps Hermes is preparing a second issue, when more colours will be offered. professional accomplishment and source of profound inspiration, the French gardens have reached their apogy in the 17th century under France's Louis XIV, the Sun King, with the construction of the Gardens of Versailles by the royal lanscape architect, Andre le Notre. The actual inspiration for this design came, according to Hermes, from the secret miniature gardens atop the Hermes boutique on rue du Faubourg St.-Honore, accessible to a fortunate few.